Chobani Yogurt Review 2018: The Healthiest Greek Yogurt? Home | Natural Ingredients | Chobani Yogurt Review 2019: The Healthiest Greek Yogurt? 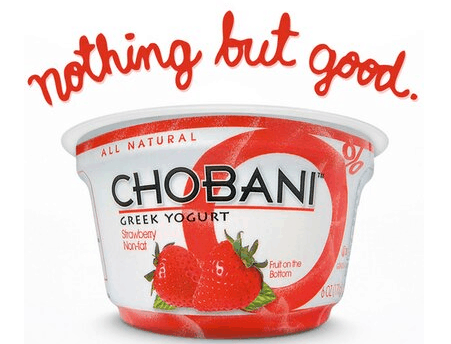 Chobani Yogurt Review 2019: The Healthiest Greek Yogurt? If you’re a yogurt fan, and you’re living in the US, the UK, or Australia, chances are you have tasted Chobani yogurt at least a couple of times in your life. If you try Googling “most popular Greek yogurt in the US,” Chobani keeps topping the charts in almost every testing for the best Greek yogurt. Today there are many brands producing Greek style yogurt, some of which are largely unknown, due to their only being sold in their immediate local area, and some which have stopped producing altogether. 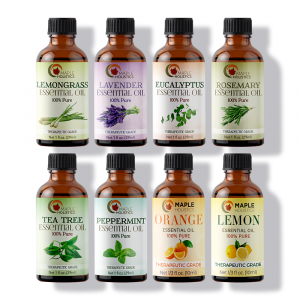 What is it about this particular brand that stands out among others on the market? Before Chobani was established in 2005, Greek yogurt was basically unheard of in America. Certainly, your average grocery store did not stock what was then a specialty item. Chobani not only cornered the market on Greek yogurt, but virtually invented it, giving it an automatic advantage. We’ll break down Chobani and its delicious yogurts in our full review – only at Maple Holistics! It all began, as most things do, with a vision. Turkish immigrant Hamdi Ulukaya had been living in New York for just under a decade when he realized that America was sorely lacking in what he calls “authentic” yogurt. He found the taste of America’s yogurt bland, aside from the unnecessary amount of sugar and lack of natural ingredients in the yogurts at that time. Coming across an advertisement for an old yogurt factory owned by Kraft that was being shut down in South Edmeston, New York, Ulukaya saw his chance and took out a loan to purchase the factory. Together with four employees that he hired who had worked at the plant previously, as well as a yogurt master whom he knew from his native Turkey, Hamdi Ulukaya worked to make his vision a reality. Naming his new company ‘Chobani,’ from the Turkish word ‘coban’ meaning shepherd, the team worked for over a year to create the perfect product. In 2007, Chobani was officially released to the public, and became an immediate sensation. Greek yogurt is now a staple of the Western diet, but it all started here! Chobani’s “Nothing But Good” Campaign. Chobani yogurt, unlike regular yogurt, is strained, meaning that it has twice the amount of protein that regular yogurt has – between 11 and 15 grams of protein per 5.3-ounce cup. Straining also removes excess liquid whey, which is why it has that thick and smooth texture that we all love. Chobani’s Greek yogurt contains five live and active cultures, three of which contain probiotics (bacteria that is believed to help lower chances of obesity). The ingredients are all natural. Read: no preservatives, artificial flavors or sugars. Only real fruits and real milk (not milk protein concentrate) are used in Chobani’s yogurts. This not only results in an authentic flavor, but is also a lot better for your body than many of the other yogurts on the market, whose ingredients are not all natural and who add in generous amounts of sugar or other sweeteners. Each Chobani yogurt contains three cups of milk, which is the recommended amount of dairy intake per day for adults. Chobani Greek Yogurt and Chobani Smooth Classic Yogurt both contain less than 5% lactose, catering towards those who are lactose intolerant. There’s a reason Chobani has become so popular in such a relatively short amount of time. By using prime natural ingredients, it helps you to feel good about your snack choices without the guilt that choosing high-sugar snacks leaves you with. Its smooth texture and real fruit taste are what defines Chobani and have made it into an international success. 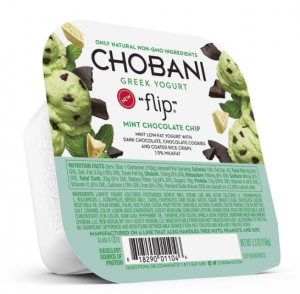 Chobani Flip Snacks Mint Chocolate Chip. Following the success of the Chobani yogurt range, the company released three new products in 2013. One of these was the Chobani Flip Snack, which comes in assorted flavors. What is a Flip snack? It’s basically the yogurts we have all come to love, with a crunch on the side, packaged in a cute and practical two-component tub, making it an easy and delicious on-the-go snack. The Flip snacks come in a range of different flavors with varying crunch toppings. 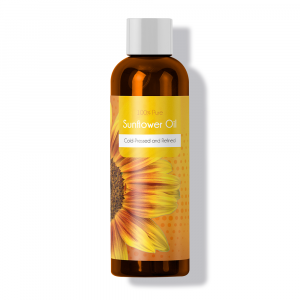 I have chosen a few that in my humble opinion, are some of the best of this product’s range. Feel free to visit Chobani to view the full list of flavors available. Mint Chocolate Chip – I mean, honestly, who couldn’t love this? The low-fat mint yogurt comes with a side crunch of dark chocolate, chocolate cookies and coated rice crisps. Okay, confession: chocolate is my weak spot. But the awesome thing about Chobani is that it has managed to create a healthier snack alternative using chocolate together with the delicious flavor of the mint yogurt. Seriously, it doesn’t get better than that. Nutty for ‘Nana – This Flip snack features banana low-fat yogurt with a side crunch of honey roasted salted almonds and, yes, dark chocolate (I can’t help it). It has that delicious, smooth flavor that characterises Chobani and also has less sugars than other Flip snacks. Perfect Peach Cobbler – as its name suggests, this Flip snack is as perfect as a snack should be. It features low-fat peach yogurt with oatmeal pastry pieces and frosted cinnamon crunch. 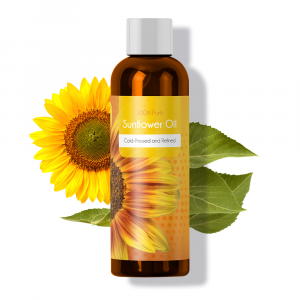 The total fat in this product is only 4 grams, without compromising at all on the taste. RELATED: Check out our That’s It Bars Review! Chobani’s “Simply 100” Greek yogurts are yogurts that, like all Chobani products, use only natural ingredients, but have only 100 calories per tub, making it the only product of its kind. This product comes in six flavors: Blueberry, Strawberry, Pineapple, Peach, Black Cherry and Vanilla. The development of the Simply 100 line took Chobani two years to complete, but there’s no question that it has been highly popular since it was released in 2013. Chobani Strawberry On The Bottom. Black Cherry: The fact that Chobani uses actual cherries in this product makes a real nice change from other products that don’t use natural ingredients. Fake cherry flavor tends to be overpowering and sickly sweet, not at all like the natural flavor of the fruit. Chobani’s Black Cherry yogurt uses non-fat yogurt and real cherries, which captures the cherries’ delicious natural taste, making this a great product all-round. 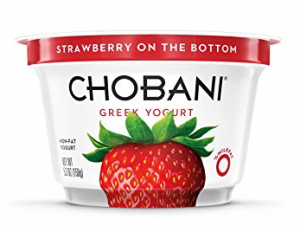 Strawberry: This is probably one of the most classic yogurt flavors for any company, and Chobani does a great job capturing this delicious flavor. This yogurt has zero percent saturated fat and trans-fat, and makes a great smoothie base. Peach: After strawberry, this is one of the most popular Chobani products, with real fruit complementing the low-fat yogurt. Chobani “Fruit On The Bottom” are low-fat or non-fat yogurts with fruit underneath. The fruit mixture tastes great when mixed into the yogurt covering it and makes for a quick and healthy snack. Discover Bare Snacks For A Healthier Snack Option! Just last year, Chobani announced the launch of a new product: Chobani yogurt drinks. Once again, they have created a superior product: when compared with other yogurt drinks, Chobani’s have 1/3 less sugar, and each drink has 14 grams of protein. They’re a great way to start your day or to have as a snack when you don’t feel like eating something heavy, but still want to eat something that’s good for you. Orange and Cream: This drink is exactly that. 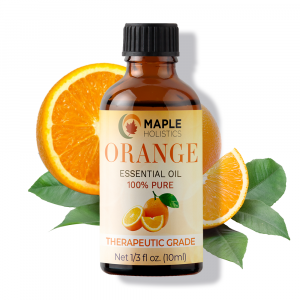 It is creamy and smooth, with an authentic, fresh orange flavor. Mixed Berry: This flavor of yogurt drink has the perfect ‘kick’, with blueberries, raspberries, blackberries, and other natural flavors. When compared with other drinks like iced mocha, fruit punch drink, citrus energy drink and sweet lemon tea, Chobani drinks have more fibre, protein, and calcium, and significantly less sugar. Because of its high protein content, it keeps you satisfied for longer and gives your body energy. To see the full list of available flavors for Chobani drinks, visit the Chobani website. And of course, there is the hugely popular Chobani Kids yogurt. I worked in a daycare center a couple of years ago, and I’m pretty sure every child there brought a Chobani yogurt for a snack. In fact, I specifically remember one child whose Chobani yogurt the staff would hide, because if he saw it before he had eaten his lunch he would refuse to touch anything in his lunchbox and would demand the yogurt. Kids love this yogurt because of its great taste, and because of the fun packaging that makes it unique. Chobani yogurts come in squeeze pouches, with twist lids so kids can eat their fill and then return it to the fridge to save the rest for later. 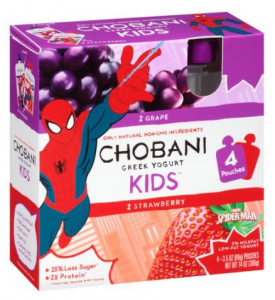 These yogurts come in kid -friendly flavors of strawberry and mixed berry – and of course, having Spider-Man featuring on each pouch helps. 6 oz Chobani Vanilla Greek yogurt. 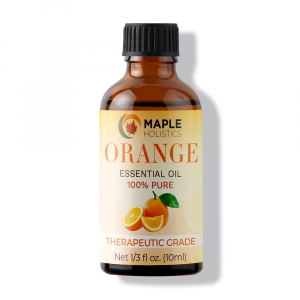 1 tsp. baking soda (this results in fluffier pancakes, but you could also use baking powder). Mix the yogurt until it is smooth in consistency, and the excess liquid on top has been fully incorporated. Next, crack the egg over the yogurt and stir it into the yogurt. Set aside. In a medium-sized bowl, mix the flour and baking soda together. Add the yogurt mixture to the flour mixture and mix to combine. The yogurt should make the mixture very thick. Spray a pan with the oil and wait for it to heat. 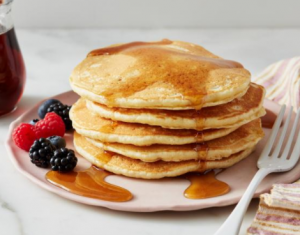 Once hot, spoon batter into the pan to form pancakes. I personally prefer smaller pancakes, but feel free to make them whatever size appeals to you. When you see bubbles on the surface, it means your pancakes are ready to be flipped. Cook them until golden brown on each side and serve with your favorite syrup or topping. Because of the versatility of vanilla flavor, I would recommend it as you can’t really go wrong. If you’re feeling more adventurous though, why not try using your favorite fruit flavor Chobani yogurt? You won’t regret it! Ultimately, choosing Chobani is an obvious choice. You are guaranteed a healthy, satisfying snack, whose ingredients are great for your body, without losing out on the great taste you’re after. Whoever you may be, whatever your dietary need are – there’s a Chobani option out there for you (well, probably more than one)! Whether your body is sensitive to lactose, which would mean that you can’t handle other yogurt products, or you are on a low-fat diet, or you are looking for the perfect snack for your fussy toddler or child – once you have discovered Chobani, you are assured a gratifying addition to your day, filled with the best stuff that nature has to offer. So grab a spoon and your favorite Chobani snack, and let the magic happen.